Al Abri R, Kolethekkat AA, Kelleher MO, Myles LM, Glasby MA. Effect of Locally Administered Ciliary Neurotrophic Factor on the Survival of Transected and Repaired Adult Sheep Facial Nerve. Oman Med J 2014 May; 29(3):208-213. Despite good microsurgical techniques for the repair of peripheral nerve injuries and the use of nerve grafts and conduits for bridging the defects, the functional nerve recovery is generally partial and unsatisfactory. Over the last decade, several studies have focused on enhancing nerve regeneration and overcoming the problems of nerve grafting. It is now widely accepted that nerve repair largely depends on the response to injury using cells and/or exogenous peptides. The supply of neurotrophic factors in experimental studies support the survival of nerve cells. Ciliary Neurotrophic Factor (CNTF) have profound effect on the in vitro survival of neuronal cell types such as sympathetic neurons, dorsal root, trigeminal, nodosa ganglia and spinal motor neurons.1 In addition, studies have supported its role in inducing motor neuron sprouting on embryonal spinal motor neurons and perinatal motor neurons.2 Motor neuron sprouting may be controlled by the release of soluble cytokines or neurotrophic factors by muscle satellite cells or cellular elements of intramuscular nerves.2 In vitro candidate factors like CNTF, Basic fibroblast growth factors (bFGF) and insulin like growth factors 2 (IGF2) support the survival and growth in the culture of highly purified chick motor neurons.3 Exogenous application of CNTF also support the survival of spinal motor neurons in vivo and preserves rats from axotomy induced cell death.4 As a result, the neurotrophic factors such as CNTF, have great clinical interest in addressing whether they can supplement damaged nerve in order to enhance recovery. The observation that CNTF is present abundantly in the Schwann cells of peripheral nerves and that it prevents lesion mediated degeneration of motor neurons in post natal rats is compatible with the assumption that CNTF might also act as a lesion factor making it a candidate for degenerative changes of motor neurons.5 The effect of CNTF on facial nerve injuries has been found to be useful by enhancing the survival of motor neurons in chicks, the neonatal motor neurons and muscle nerve fiber innervations in rats in different studies.6,7 However, there is a paucity of literature on the study of CNTF on adult facial nerves in animal models and hence, we conducted an electrophysiological experimental study on adult sheep facial nerve to denote whether exogenous CNTF has any promising role in preventing degeneration and/or promoting the regeneration. The experimental model was the buccal branch of facial nerve. In the CNTF group, the facial nerve was transected and then repaired by simple epineurial suturing and CNTF was injected daily for 28 days over the left depressor labii maxillaris. These animals were allowed to recover and reassessed after nine months. Detailed electrophysiological, morphometric and tension experiments were carried out. All experimental procedures were performed under general anesthesia. Anesthesia was induced by intravenous bolus dose of thiopentone sodium (0.2 ml/Kg of 10% solution, Merial Animal Heath Ltd, Essex, UK). The sheep were intubated with cuffed endotraheal tube (Portex, Blueline) with 24 hrs of fasting prior to surgery. Anesthesia was maintained with a mixture of 6 l/mt of oxygen, 2 l/mt of nitrous oxide and 1-2% vaporized halothane (May & Baker, Rhone-Poulenc Group, UK). Intra-operative monitoring was performed by ECG and pulse oximeter. The animal was positioned on the table lying on its right side, the wool and hair of the entire area between the ear and muzzle on the left side was shaved and the skin was prepared for surgery. Silver/silver chloride transcutaneous recording electrodes were positioned with the cathode over the depressor labii maxillaris which are uniquely innervated by the buccal branch of the facial nerve. The anode was placed nearby over the tendon of the same muscle. The ground electrode was placed over levator nasolabialis. The position of the buccal branch was thus identified and mapped out using transcutaneous supramaximal constant current stimulation from hand held stimulator (Medelec Sapphire; Vcikens; Woking, UK). Figure 1: Photograph showing the buccal branch of facial nerve in adult sheep. 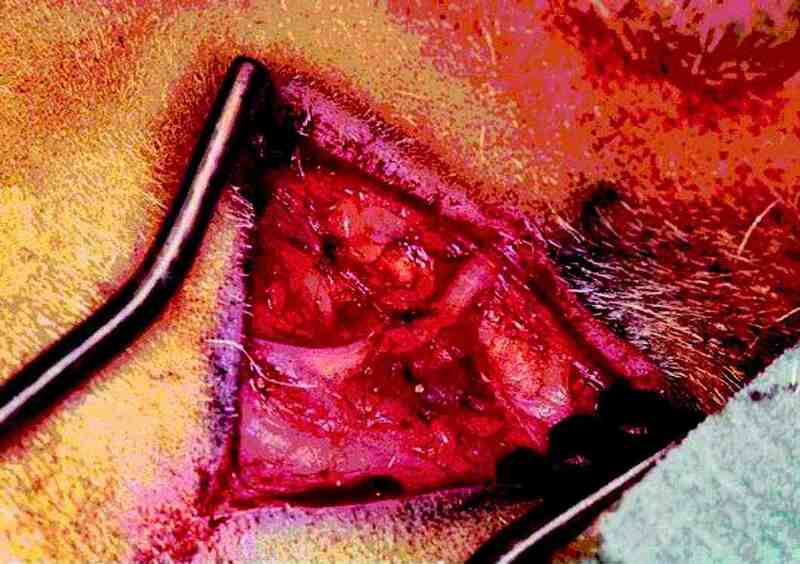 In all of the sheep, a skin incision was made over the buccal branch of the left facial nerve and skin flaps were raised about 2 cm on either side of the nerve. Thin subcutaneous tissue layer was dissected to reveal the buccal branch of facial nerve which was then stimulated with a hand held stimulator to confirm the identity. The nerve was separated from underlying tissues over a length of about 8 cm (Fig. 1). Hemostasis was achieved with bipolar diathermy. Stimulating electrodes were placed at both ends of the separated buccal branch of the facial nerve, one at each end. Detailed electrophysiological studies were then carried out. In the CNTF group, the buccal branch of facial nerve was transected using Meyer neurotome about 4 cm distal to its emergence from the parotid gland, the site of transition being at the mid point of the exposed segment and equidistant from the stimulating electrodes. The cut ends of the nerve were brought into apposition and repaired using 10/0 polyamide interrupted epineural tension free sutures (Ethilon). A baseline electrophysiological study was performed prior to the wound closure. The animals then received daily injection of 12.85 microgram of Recombinant human CNTF dissolved in 0.5 ml phosphate buffered saline (R & D systems) for a period of 28 days over the left depressor labii maxillaris muscle which lies in the vicinity of the transected and repaired nerve at nerve muscle interface under local anesthesia using 2% Xylocaine spray (Astra Pharmaceuticals Ltd, King Langley, England). This duration was thought to provide a 10-fold increase in the concentration compared to the concentration required at the level of imjury based on a previous work done in our department. In the control sheep, the experiments were performed and then were euthanized with an over dose of intravenous Phenobarbital sodium (20 mg/kg, WestWard Pharmaceutical Corp). In the CNTF group, the sheep were again anesthetized after nine months in the same fashion and the site of facial nerve repair were exposed. Detailed electrophysiological studies and tension experiments were performed. On completion of the test they were euthanized. The sections of repaired nerve were harvested for morphometric studies. We used Medelec Sapphire 4ME II EMG unit (Medelec, Old Woking, UK) to stimulate the nerve and record the events. The first test performed was jitter, which involved stimulating the terminal motor fibers of the nerve 100 times and then recording the variability in the transmission time of neuromuscular junction of the depressor labii maxillaris. Two monopolar needle electrodes (Medelec MF-37, Old Woking, UK) were used to stimulate facial nerve, one electrode was inserted in the motor point of the depressor labii maxillaris as cathode and the second was inserted approximately 1 cm proximal and 1 cm lateral to the cathode, functioning as an anode. A current of amplitude of 1mA of duration 50 microseconds was applied between these electrodes to stimulate a terminal nerve fiber, the stimulus frequency being set at 10 Hz. The current was increased by 0.1 mA until small twitches were observed, at this point a single fiber electromyography (SF-EMG) needle was inserted into the twitching portion of the muscle belly approximately 2 cm distal to the cathode and adjusted the amplitude of current until a repeated muscle fiber action potential was recordable. The mean consecutive difference (MCD) was then calculated. This process was repeated for 20 different motor units and the average of the recordings was called the jitter of that muscle. The buccal branch was then exposed; a non traumatic low impedance platinum wire bipolar stimulating electrode (Harvard Electronics, USA) was placed under the nerve and positioned proximally. Another bipolar electrode was placed distal to the repair site, the distance between the two was always kept greater than 5 cm to improve accuracy. Two 6 mm silver/silver chloride disc recording electrodes were placed on the skin over the depressor labii maxillaris to record the contractions upon stimulation of the nerve. The cathode was placed lateral to the motor point and the anode over the tendon of insertion. A ground electrode was placed over the skin of nasal bones. Once all the parameters were set, the buccal branch was stimulated. From the observations, the electrophysiological indices such as maximum conduction velocity (CVmax), refractory period, and minimum conduction velocity (CVmin) were measured. Both CVmax and CVmin were calculated from the difference in latencies of the compound muscle action potential (M waves) when the nerve was stimulated appropriately at the proximal and distal sites, divided by the distance between the two sites. CV max or CVmin = d/t, Where d is the distance between stimulating electrode and t is the difference in latencies between two electrodes. The absolute refractory period was recorded using paired shock technique by calculating M wave (M1 and M2) at two supramaximal stimuli (S1 and S2) with an initial time delay between them at 8.0 ms. The time delay between S1 and S2 was reduced till the M2 wave disappeared, the time delay at which this occured was called the absolute refractory period. On completion of electrophysiological tests, the tendon of the depressor labii maxillaris was tied using 4/0 silk and then attached to a steel wire connected to an isometric tension transducer (Harvard Biosciences, USA), the output signal was connected to the Y input of an oscilloscope (Gould, UK). The RS-232 output from the EMG machine was connected to the trigger input of the oscilloscope with a 75-ohm BNC cable. With this setting, the buccal nerve was stimulated at S2 with a supramaximal current and the twitch tension measurements were recorded. At the end of the experiment, the nerve specimens were taken from all the buccal branches during the second stage evaluation except in the control group, which were taken in the first stage. Then 2.5% Glutaraldehyde in 0.1 sodium cacodylate solution was used as fixative for electron microscopy followed by treatment with 0.1% osmium tetroxide which is essential for myelin preservation. After one hour, the nerves were cut into 1 mm sections and then dehydrated in graded alcohols and stained with toludine blue. Nerve sections were then viewed under a compound microscope (Zeiss, Germany) at 400 × magnification. Morphometric analysis - measurement of fiber diameter, axon diameter, myelin sheath thickness and g ratio (axon diameter / fiber diameter) were conducted using an image analysis programmer (Analytical Imaging Station -AIS, version 3.0, Imaging Research Inc, Canada). Prior to undertaking the experiments, the required sample size was calculated using the Kirkwood formula.11 From the work of Fullerton et al. for CVmax, if we expect an appreciable effect to be a difference of 15 m/s between the groups with a standard deviation of 7 m/s, the calculated group size would be 4.59.12 Application of this principle to all of the variables measured experimentally indicated that a group size of 5 animals was acceptable. All statistical calculations and graph plotting of these experiments were performed using the statistics program statistica (version 6- Statsoft Inc, 2300 East 14th street, Tulsa, O.K., 71404, USA). The independent or grouping variables were the type of experiments and the dependent variables were the electrophysiological and morphometric measurements. Half normal plots were constructed to identify and reject outliers from within the raw data. The columns of data were then again plotted as normal probability plots in order to determine whether or not the data fitted a normal distribution. The next two stages in statistical testing were directed at identifying the presence of differences (variants of F test) and post hoc tests where those differences lay (variants students t test). For normally distributed data, the F test was applied in the form of one way ANOVA and for data that were not parametrically (normally) distributed, the Kruskal- Wallis test was used. Post hoc tests employed both the Mann Whitney U test (physiological and tension data) and the Kolmogorov Smirnov (morphometric data). There was no morbidity in CNTF as well as the control group. To assess the nerve repair, the CVmax, CVmin, area and amplitude of compound muscle action potential, refractory periods (absolute and relative) and tension tests were studied. There were no significant differences between skin CVmax and CVmax in 95% confidence interval and it was just above zero for CVmin as expected. Also, 95% confidence interval for skin CVmax and CVmax was higher in the control group compared with the CNTF group. The mean skin CVmin was marginally higher in the CNTF group than in the control group but was not statistically significant (Fig. 2). Figure 3: Box and Whisker plot showing the mean relative and absolute refractory periods of the control and CNTF groups. (RRP- relative refractory period, ARP- absolute refractory period, SE- standard error, SD- standard deviation). Figure 4: Box and Whisker plot showing area and amplitude of M wave of the control and CNTF groups (SE- standard error, SD- standard deviation). Figure 5: Box and Whisker plot showing time tension index and mean tetanus of the control and CNTF groups (SE- standard error, SD- standard deviation). 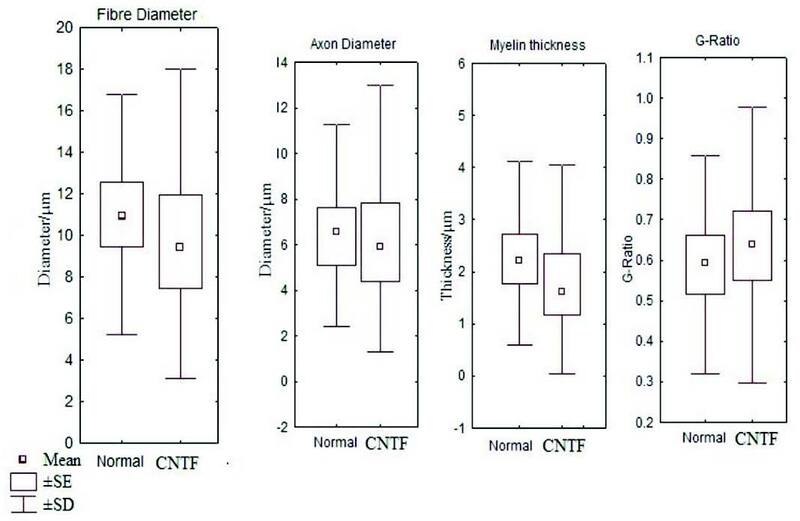 Figure 6: Box and whisker plot comparing the fibre diameter, axon diameter, myelin thickness and g ratio between the control and CNTF groups (SE- standard error, SD- standard deviation). The noticeable side effects witnessed in the recent CNTF /amyotrophic lateral sclerosis trials limit the potential application of local or systemic CNTF.20 The main limitation of using CNTF in experimental animals is its inefficiency to cross the blood brain barrier.21 In our study, CNTF was applied at the level of target organ by injecting CNTF into the muscle with the aim of demonstrating the effect of the local applications of CNTF in the nerve regeneration after repair and we did not notice any side effects in doing so. In our study however, it seems unlikely that any of the chemical enhancements tested was of use in producing a clinically measurable effect and at present, it is not permissible to recommend the use of CNTF for enhancement of nerve regeneration. In the literature, the significant beneficial effect of CNTF locally applied at the site of injury of the facial nerve has not been shown. Following the transection of nerve, there is a down regulation of CNTF synthesis and more importantly, a massive down regulation of CNTF alpha expression in the motor neurons one day after axotomy.25,26 In these animals, the axotomized motorneurons could be rescued by exogenous applications of CNTF through an alternate pathway which is unclear till date.27 Sendter et al. have proven in their study on adult mice that the endogenous expression of CNTF released from lesioned schwann cells supports the survival of axotomized motorneurons under conditions but not the role of exogenous CNTF on repaired nerves.21 Gurney et al. reported the CNTF induces the motor neuron sprouting from end plates and from a subset of nodes of ranvier in the adult mouse gluteus muscle and its effect is potentiated by bFEF.2 Ulenkate et al. in their study on young adult rats after facial nerve crush concluded that CNTF had no obvious effects on retrograde cell reaction.6 A previous study by similar authors on sheep model by delivering the CNTF at the site of the cell body after sectioning and resuturing the median nerve on sheep also did not show a conferring benefit.28 Our study too has showed that CNTF has no significant effect on nerve regeneration. Even though several studies have shown that CNTF protein are detectable at extracellular sites in the distal portion of the lesioned nerves even when CNTF mRNA levels are low, axonal contact is not apparently the only mechanism which regulates the expression of CNTF in schwann cells as strongly schwann cells can also be detected in the regions of the lesioned schwann cells which have not been reached by regenerating nerve fibers.1 An assumption that regeneration depends on a sequential action of multiple neurotrophic factors hypothesized here due to the negative study which needs further multiple research and evidence. 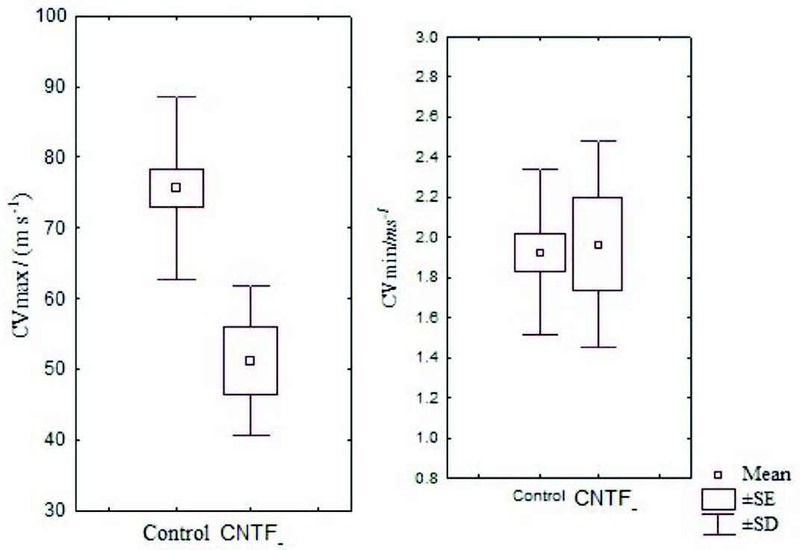 Locally administered CNTF has no significant effect on adult transected facial nerve regeneration even though it has been noticed to be promising results in neonatal animals. It is likely that multiple studies will be required on large animal models before establishing its role in the enhancement of neuronal regeneration. The authors would like to thank Miss Gall Valler for expert technical help. This experimental work was supported by a grant from Sultan Qaboos University in the year 2000 and the first author is the recipient of the grant. The authors declare no conflicts or competing interest. 1. Sendtner M, Stöckli KA, Thoenen H. Synthesis and localization of ciliary neurotrophic factor in the sciatic nerve of the adult rat after lesion and during regeneration. J Cell Biol 1992 Jul;118(1):139-148. 2. Gurney ME, Yamamoto H, Kwon Y. Induction of motor neuron sprouting in vivo by ciliary neurotrophic factor and basic fibroblast growth factor. J Neurosci 1992 Aug;12(8):3241-3247. 3. 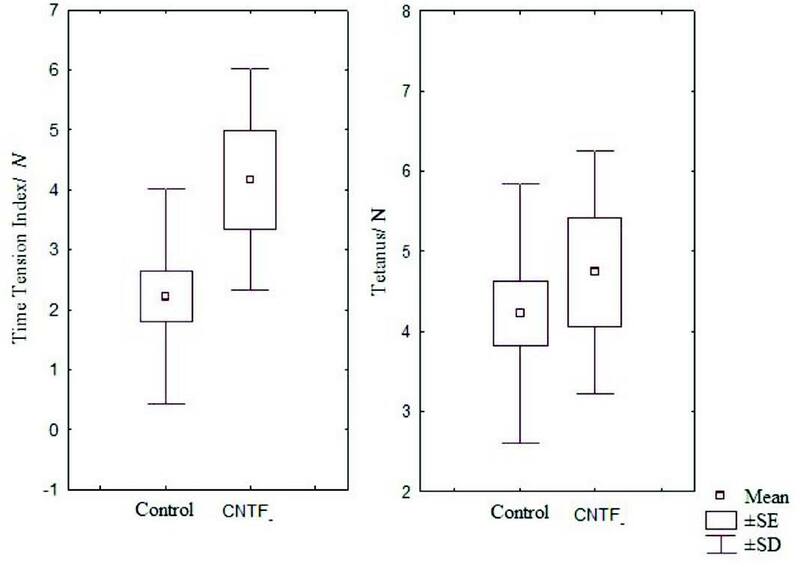 Arakawa Y, Sendtner M, Thoenen H. Survival effect of ciliary neurotrophic factor (CNTF) on chick embryonic motoneurons in culture: comparison with other neurotrophic factors and cytokines. J Neurosci 1990 Nov;10(11):3507-3515. 4. Sendtner M, Kreutzberg GW, Thoenen H. Ciliary neurotrophic factor prevents the degeneration of motor neurons after axotomy. Nature 1990 May;345(6274):440-441. 5. 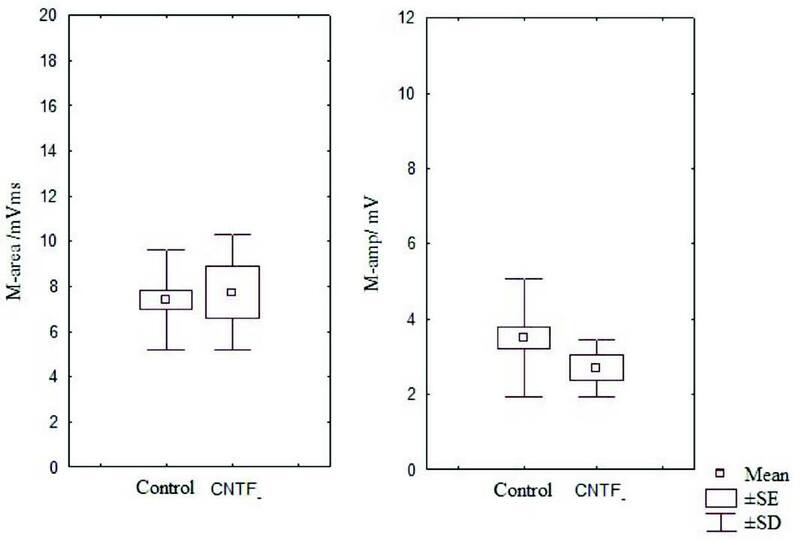 Sendtner M, Arakawa Y, Stöckli KA, Kreutzberg GW, Thoenen H. Effect of ciliary neurotrophic factor (CNTF) on motoneuron survival. J Cell Sci Suppl 1991;15:103-109. 6. Ulenkate HJ, Gispen WH, Jennekens FG. Effects of ciliary neurotrophic factor on retrograde cell reaction after facial nerve crush in young adult rats. Brain Res 1996 Apr;717(1-2):29-37. 7. Ulenkate HJ, Kaal EC, Gispen WH, Jennekens FG. Ciliary neurotrophic factor improves muscle fibre reinnervation after facial nerve crush in young rats. Acta Neuropathol 1994;88(6):558-564. 8. Drew SJ, Fullarton AC, Glasby MA, Mountain RE, Murry JA. Reinnervation of facial nerve territory using a composite hypoglossal nerve muscle autograft facial nerve bridge. Vlin Otolaryngol 1995;20:109-117 . 9. Fullarton AC, Glasby MA, Lason GM. Immediate and delayed nerve repair using freeze thawed muscle autografts in complex nerve injuries. Associated long bone fracture. J Hand Surg Am 1998;23B:360-364 . 10. Fullarton AC, Myles LM, Lenihan DV, Hems TE, Glasby MA. Obstetric brachial plexus palsy: a comparison of the degree of recovery after repair of a C6 ventral root avulsion in newborn and adult sheep. Br J Plast Surg 2001 Dec;54(8):697-704. 11. Kirkwood BR. Comparison of several means_analysis of variance. In: Kirkwood BR (ed) Essentials of medical statistics. Blackwell Scientific Publications: Oxford; 1991: pp 46-55. 12. Fullarton AC, Lenihan DV, Myles LM, Glasby MA. Obstetric brachial plexus palsy: a large animal model for traction injury and its repair. Part 1: age of the recipient. J Hand Surg Br 2000 Feb;25(1):52-57. 13. Johnson EO, Charchanti A, Soucacos PN. Nerve repair: Experimental and clinical evaluation of neurotrophic factors in peripheral nerve regeneration. Injury, Int. J. Care injured 2008; 39S:S37-42. 14. Barbin G, Manthorpe M, Varon S. Purification of the chick eye ciliary neuronotrophic factor. J Neurochem 1984 Nov;43(5):1468-1478. 15. Kuhlmann T, Remington L, Cognet I, Bourbonniere L, Zehntner S, Guilhot F, et al. Continued administration of ciliary neurotrophic factor protects mice from inflammatory pathology in experimental autoimmune encephalomyelitis. Am J Pathol 2006 Aug;169(2):584-598. 16. Sleeman MW, Anderson KD, Lambert PD, Yancopoulos GD, Wiegand SJ. The ciliary neurotrophic factor and its receptor, CNTFR alpha. Pharm Acta Helv 2000 Mar;74(2-3):265-272. 17. Davis S, Aldrich TH, Ip NY, Stahl N, Scherer S, Farruggella T, et al. 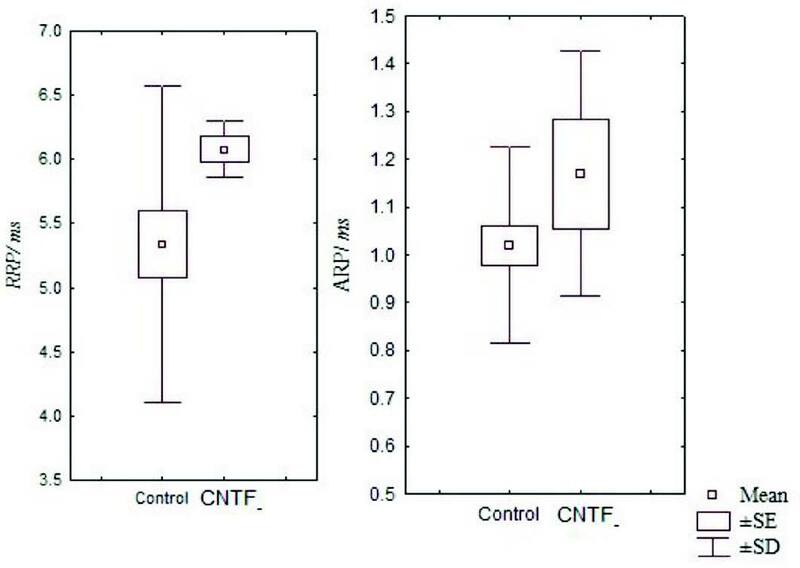 Released form of CNTF receptor alpha component as a soluble mediator of CNTF responses. Science 1993 Mar;259(5102):1736-1739. 18. Sendtner M, Carroll P, Holtmann B, Hughes RA, Thoenen H. Ciliary neurotrophic factor. J Neurobiol 1994 Nov;25(11):1436-1453. 19. Oppenheim RW, Prevette D, Yin QW, Collins F, MacDonald J. Control of embryonic motoneuron survival in vivo by ciliary neurotrophic factor. Science 1991 Mar;251(5001):1616-1618. 20. Miller RG, Petajan JH, Bryan WW, Armon C, Barohn RJ, Goodpasture JC, et al. A placebo-controlled trial of recombinant human ciliary neurotrophic (rhCNTF) factor in amyotrophic lateral sclerosis. rhCNTF ALS Study Group. Ann Neurol 1996 Feb;39(2):256-260. 21. Dittrich F, Thoenen H, Sendtner M. Ciliary neurotrophic factor: pharmacokinetics and acute-phase response in rat. Ann Neurol 1994 Feb;35(2):151-163. 22. Forger NG, Wong V, Breedlove SM. Ciliary neurotrophic factor arrests muscle and motoneuron degeneration in androgen-insensitive rats. J Neurobiol 1995 Nov;28(3):354-362. 23. Sendtner M, Gotz R, Holtmann B, Thoenen H. Endogenous Ciliary neurotrophic factor Is a Lesion Factor for Axotomized Motorneurons in Adult Mice. Nature 1997;345:440-441. 24. Sendtner M, Holtmann B, Hughes RA. The response of motoneurons to neurotrophins. Neurochem Res 1996 Jul;21(7):831-841. 25. Friedman B, Scherer SS, Rudge JS, Helgren M, Morrisey D, McClain J, et al. Regulation of ciliary neurotrophic factor expression in myelin-related Schwann cells in vivo. Neuron 1992 Aug;9(2):295-305. 26. Ito Y, Yamamoto M, Li M, Doyu M, Tanaka F, Mutch T, et al. Differential temporal expression of mRNAs for ciliary neurotrophic factor (CNTF), leukemia inhibitory factor (LIF), interleukin-6 (IL-6), and their receptors (CNTFR alpha, LIFR beta, IL-6R alpha and gp130) in injured peripheral nerves. Brain Res 1998 May;793(1-2):321-327. 27. Kirsch M, Terheggen U, Hofmann HD. Ciliary neurotrophic factor is an early lesion-induced retrograde signal for axotomized facial motoneurons. Mol Cell Neurosci 2003 Sep;24(1):130-138. 28. Kelleher MO, Myles LM, Al-Abri RK, Glasby MA. The use of ciliary neurotrophic factor to promote recovery after peripheral nerve injury by delivering it at the site of the cell body. Acta Neurochir (Wien) 2006 Jan;148(1):55-60, discussion 60-61.